Tipard DVD Cloner for Mac is the fastest and easiest Mac DVD Copy software, which is capable of backup DVD disc to DVD disc, copy DVD disc to DVD folder/iso file and vice versa. It can compress DVD-9 to DVD-5 preserving the original quality with three copy modes - Full Copy, Main Movie and Customized. Why use Tipard DVD Cloner 6 for Mac? This Mac DVD Copy software provides best solution to clone DVD disc with 1:1 ratio and it offers three modes of Full Copy, Main Movie and Customized for users to use it easily. Tipard DVD Cloner for Mac wins great reputation from users with multi-functional DVD copy features. It have a high compatibility with DVD disc, covering all DVDs, even the latest one. Not only can this Mac DVD cloner software copy DVD Disc (DVD-9 to DVD-9, DVD-5 to DVD-5, DVD-9 to DVD-5), but also it enables users to backup DVD disc to local computer as DVD folder or DVD iso image files. The version copy direction from DVD folder or iso file to DVD disc is also available. Besides, this copy quality is rather high, and the DVD copy from DVD-9 to DVD-9 and DVD-5 to DVD-5 can be reached 1:1 ratio, even the compression copy from DVD-9 to DVD-5 can keep high quality. 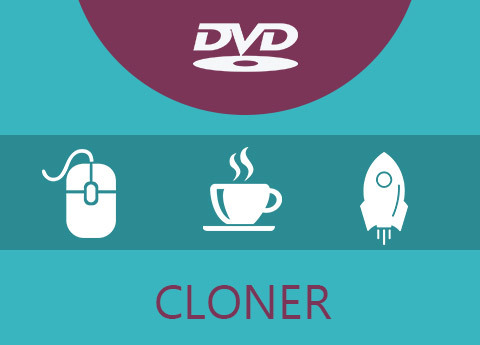 This DVD Cloner for Mac is popular Mac DVD Copy software not only lies in the amazing capability to copy DVD, but also owing to its flexible option for copy modes. Thre are three copy modes for users to choose to copy DVD: Full Copy, Main Movie and Customize. As for Full Copy, the app programe will copy the whole content of the DVD and users have no choice for selection of titles, audio tracks and subtitles as needed. "Main Movie" modes as its name puts will copy the main movie of the DVD without useless titles and the programe will automatically get the main movie title for you, but the same as Full Copy, the audio track and subtitle for main movie is not selectable as well. "Customize" is much suitable for users with clear intention knowing which part needs to copy and which part is useless, all title, audio track and subtitle are optional. Tipard Mac DVD Copy software is desgined with straight-forward design and illustrated image guide, which assists users most in the process of copying DVD. The preview window is one of is lightpot, which enables users to have a preview of every title, whole value is particularly embodied in this point. The snapshot under the preview window offers users a simple way to capture any favourite scene in the DVD video and the captured image can be saved as JPG,PNG and BMP for later use. Another point that this DVD Cloner for Mac caters to most users is its provide users self-control panel of "Options", such as Remove Menu, Skip Menu (Directly play main movie), play titles as a loop, etc and actions after burning. Users can select copy numbers and writing speed when copy DVD disc to DVD disc. Desgined with straight-forward design and illustrated image guide, which assists users most in the process of copying DVD. Tipard Mac DVD Cloner provides duration for detect the upgrade version: Every Day, Every Week or Every Month. Aaron: Amazing DVD Copy software. I have used it to copy one DVD-9 movie to DVD-5 and I like the keys of compress ratio that this copy software offerred when compressing. Moreover, I can select skip the menu or not. Abbott: The most attractive feature for me is the copy modes for Main Movie and Customized. Surprisingly, this Main Movie part can audtomatically help you select the main move without your picking from countless titles. Copy DVD, Rip DVD and convert video to various format, transfer iPod files and make iPhone ringtone. Rip any DVD disc/movie to video format like MP4, MOV, AVI, WMV, MKV and more at super fast speed. Create DVD disc/folder/iso image file with popular videos like MP4, AVI, MOV, FLV, MKV, and more on Mac.